Essentially, the Trio6 Be is a three-way speaker with a 1” tweeter, a 5” woofer, and an 8” subwoofer. Yet, switching to FOCUS mode reconfigures Trio6 Be in two-way monitor. The Trio6 Be was designed to meet the standards of the most demanding engineers. This dual monitor is the new reference in its price range owing to its extreme neutrality, its precise stereophonic imaging, and its ability to resolve the most minute sonic details, while its Class G amplifiers deliver SPL levels to suit all musical styles. In essence, Focal’s Trio6 Be is a three-way speaker with a 1” tweeter, a 5” woofer, and an 8” subwoofer. However, switching to FOCUS mode reconfigures the Trio6 into a two-way monitor. Designed to surpass the standards of the most exacting engineers, this dual monitor is the new reference in its price range thanks to its extreme neutrality, precise stereophonic imaging and ability to resolve the most infinitesimal sonic details. On top of that, its Class G amplifiers deliver SPL levels to suit all musical styles. A feature for which Focal has gained notoriety is the inverted-dome tweeter - it's a key factor in the magic internals behind the Trio6 Be’s outstanding performance. The specific advantage of the inverted dome is that it augments the mechanical coupling between the voice coil and the dome. Because the voice coil is fixed at mid-height on the dome, it’s capable of evenly moving the Trio6 Be’s entire cone surface. This design delivers innate high efficiency, accuracy, and energy, all resulting in a tremendously detailed soundstage. Of course, the Trio6 Be capitalises on that to full effect by employing an aluminium/magnesium alloy for the tweeter material. The Trio6 Be also capitalises on Focal's "W" composite sandwich cone. The inimitable characteristics of the cone permit optimisation of the frequency response curve, thanks to the total control of three key parameters: lightness, rigidity, and damping. 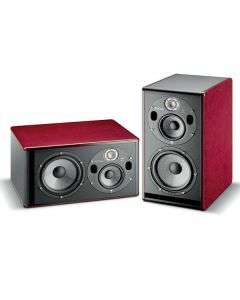 The sound is breathtakingly transparent, has an excellent phase response and an extremely low distortion rate.